It is claimed that these photos are from a Godzilla exhibit, and reveal the full body of the new Godzilla for this year's romp. Looks nice! Though, I think it wouldn't hurt if G started laying off the whale blubber a bit. 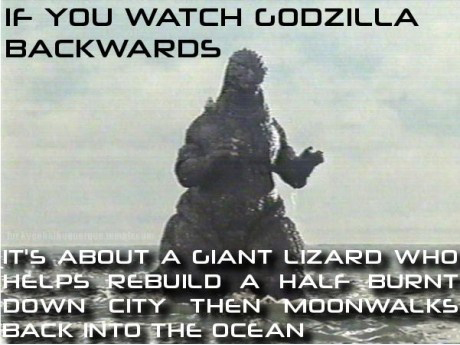 I saw a meme that was pretty funny stating that if you watch Godzilla movies backwards, it's about a benevolent giant lizard that helps rebuild cities and moonwalks into the sea. I would like to find that meme! YES! This is the movie that will make up for everything wrong with '98!!! Thank you Gareth Edwards!!! You should have seen what they did in Final Wars to that imposter. Pretty humorous I must say. My friend has been saying the monster is gonna be Rodan (Don't kill me for spelling it wrong which I probably did) I personally say it's Mothra. TDITH: I saw Final Wars many times. That part never gets old.